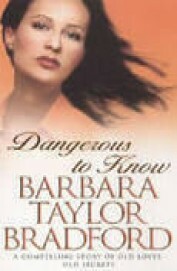 BRADFORD BARBARA: A The author of A Woman of Substance returns with her New York Times bestseller, Dangerous to Know. Charismatic millionaire Sebastian Locke is a man renowned for his charm and intelligence. When Locke is found dead at his country estate, Vivienne Trent, a journalist and Sebastian's ex-wife, sets out to find the truth about his death--and life--and uncovers startling revelations that will turn her lifeThat is why the police are profoundly baffled when Sebastian Locke is found dead at his country estate under mysterious circumstances. Has he been murdered? And if so, who would have wanted to kill the world's greatest philanthropist? Could such an upstanding man have had enemies? As in all of her previous bestsellers, Barbara Taylor Bradford engages you from the very first page in this startling new novel. From Connecticut to Provence, Paris, London, and Africa, Bradford masterfully steers you through the turbulent emotional gamut of Locke family life -- the love, lust, and passion, the ambition, jealousy and pain.